For me, Sunday is all about the Sunday newspapers. Now this is a touchy subject amongst my companions and I. Are the Sunday papers the best papers of the week, or the worst? My opinion is whole heartedly the former; The Mail on Sunday, The Observer, The Sunday Times, all so much better than their weekday counterparts. Sunday papers mean a round up of the weeks news, scattered with ample amounts of arts and culture and plenty of supplements. Heaven. There's always one book review from the Sunday papers that really grabs my attention, and this week its the review of Conversations with Myself, by Nelson Mandela, in The Observer. I'm quite keen on politics and history, and though I wouldn't by any means suggest I am a whiz on the subject, I generally know whats going on in the world of politics. I love history too, delving in to the past and reading all the different views of events. Rummaging through history is like a license to be nosey. Yet, I've never particularly looked in to the life of Nelson Mandela. It has suddenly occured to me that this is, in fact, some what of a disgrace. Afterall, he is widely regarded as the most significant leader in South Africa's history, he has a nobel prize, and he spent his whole life campaigning for rights. Of course I know the basics, and find him inspirational in as much as I know, but it seems that my lack of knowledge is set to change. After reading the review in The Observer I will certainly be putting Conversations with Myself on my 'to buy' list. The Observer describes the book as 'a literary album, containing snippets of Mandela's life, shards from diaries, calendars, letters, and also transcripts from 50 hours of recordings by Richard Stengel, who ghosted Mandela's autobiography Long Walk to Freedom. It also contains passages from an autobiography Mandela had been working on himself, in moments snatched here and there, but has finally abandoned, and allowed to be folded into this volume.' It sounds like a fascinating read. I look forward to sharing my thoughts on it with you when I've finished it. If you want to read the review in full, just follow the link. 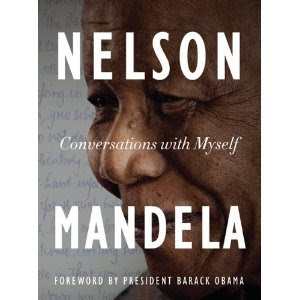 Conversations with Myself by Nelson Mandela - review. For now I must dash as there's a Sunday roast to cook. Take care.